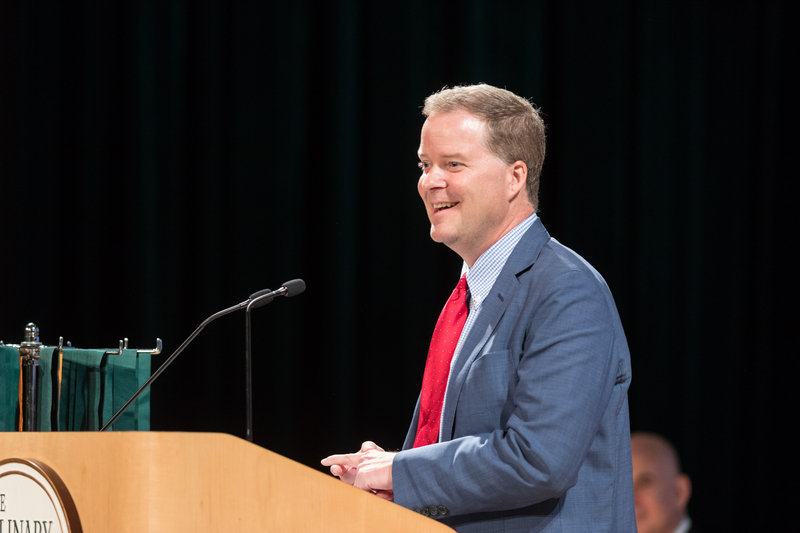 Hyde Park, NY – Riley Lagesen, founder and chair of Davis Wright Tremaine LLP, was commencement speaker at the New York campus of The Culinary Institute of America on July 26. Davis Wright Tremaine is a law firm that represents many leading chefs and restaurants across the country, and Mr. Lagesen is considered a leading legal force in the American restaurant industry. Among his clients are CIA alumni Michael Mina and Ivan Orkin, as well as chefs like Guy Fieri and restaurant groups including Momofuku and José Andrés’s ThinkFoodGroup. Mr. Lagesen is the creator of the invitation-only Restaurant High business, leadership, and advocacy summit that brings together many of the most influential minds in food. He has been a readers’ pick on the Nation’s Restaurant News “Power List” three times in the last four years. The entire CIA commencement ceremony, including Mr. Lagesen’s address, can be seen online.